Are you ready for spring? Already looking ahead to summer? 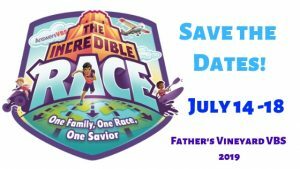 Then pull out your calendar because the dates for Father’s Vineyard’s VBS have been announced! Join us every evening July 14 – 18 for an amazing adventure across five continents and through history as we learn about the race (the human race! ), the tower of Babel and its aftermath, and everyone’s need for the One Savior! From Bible time to snacks to games and science crafts, every kid age 3 – 12 is guaranteed to have a blast while interacting with the Word of God! So save the date! We can’t wait to see you there!